Design functionality, either on top of existing assets or from scratch, by using architectural diagrams to communicate critical information about your team's software. For information about how to start to use these tools, see Getting Started with Visual Studio Application Lifecycle Management. For information about how to use these tools with Eclipse, see Team Foundation Server Plug-in for Eclipse. For information about what has been added since the previous release of Visual Studio, see What's New for Application Lifecycle Management in Visual Studio 2010. To administer Team Foundation Server, see Administering Team Foundation Server and Technical Reference for Team Foundation. Microsoft Visual Studio Team Foundation Server is the collaboration platform at the core of the Visual Studio solution for application lifecycle management. Team Foundation Server provides fundamental services such as version control, work item and bug tracking, build automation, and a data warehouse. Powerful reporting tools and dashboards provide historical trending and visibility into overall project health, and real-time metrics give early warnings of potential problems so that you can make data-driven decisions and course corrections. In addition, agile planning tools and integration with Microsoft Project and Project Server help you plan and manage your projects. Microsoft licenses Team Foundation Server under the Server/Client Access License (CAL) model. Organizations must have a license for each running instance of Team Foundation Server and, with certain exceptions, a Team Foundation Server 2010 CAL for each user or device that accesses Team Foundation Server. If you have a client access license (CAL), you can view and update data by using Team Web Access, Visual Studio, and other integrated development environments. For more information, see the following page on the Microsoft website: Microsoft Visual Studio 2010 and MSDN Licensing Whitepaper. 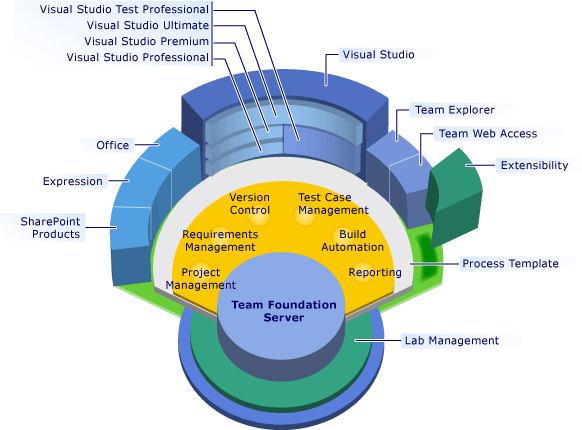 For more information about clients for Team Foundation Server, see Working with Team Foundation Clients. You can integrate other aspects of the application development lifecycle with Team Foundation Server by using one or more other products in Visual Studio Premium and Visual Studio Ultimate. Microsoft Test Manager enables you to manage and execute test cases outside Visual Studio, and create and manage physical or virtual environments. Visual Studio Premium provides a complete development toolset that simplifies the task of building applications. Advanced coding, debugging, database, and testing tools help you and your team to deliver scalable, high quality applications. Visual Studio Ultimate simplifies solution development, lowering risk and increasing return by providing tools for every stage of the lifecycle, from design and development through test and deployment. You can design your application in UML, or analyze your existing software assets. You can define your software architecture and validate that design when your team checks in and builds with Team Foundation Server. The following table shows how these tools can be used throughout the application lifecycle. For more information about the features that are available in these versions of Visual Studio, see Application Lifecycle Management Features in Visual Studio 2010.